How the Model Works - Distance is not a barrier anymore! Our model shifts the traditional paradigm in how consumers can purchase freshly-roasted, high-quality coffees and how home-roasters can purchase green beans. Through our platform, we are helping other producers cut the traditional value chain and reach the end consumer as well. In this globalized era, we are leveraging technology, e-commerce, and innovative logistic models to access the end consumer. Distance is not a barrier anymore. Also, we are striving to promote high-quality consumption in country. It is ironic how in our producing countries for centuries we have exported all our best coffees leaving the leftovers at origin. However, today it is exciting to see the next generation of coffee producers (at least those that have not lost interest) pursuing higher quality, new markets, and value-added activities. aradigm Shift Required At this moment when the C-Market has been below the $1.00 marker for months, one must question the sustainability of the coffee sector and how the future will look like (as I write this the C-Market is at a critical level of $0.9465). Even when the market is at a “higher” level, income for farmers is not enough to make ends meet, and many small-holder farmers are living in vicious cycles of poverty. Do we need to ask ourselves what are we doing to help farming families prosper? In a broken system where antiquated buying models and incredibly long value chains predominate, it is easy to forget the reality of farming communities: they are struggling and living in scarcity. Unfortunately, even though we hear about numerous “sustainability initiatives” helping producers at origin, most of them are marketing and “greenwashing” schemes” that come sadly short of having any real impact. The Time has Come to Revolutionize Value Chains Gento Coffee’s model seeks to break away from the current inefficient and volatile dynamics of the market. This new model puts farmers FIRST and leaves value-added in the country of origin assuring farmer prosperity by allowing farmers to access a more efficient trade model. Gento Coffee seeks to promote 100% origin coffee and improve conditions in farming communities through the following efforts: Better incomes for farmers and full transparency; education and training programs for producing partners; and profit-sharing to invest in programs of education and food security in the communities that we source from. 100% origin coffee means all the value is added at the country where the product is grown. For our roasted coffee, the coffee is grown, roasted, and packaged in the country of origin - in our case Guatemala. This means we make our supply chain as short as possible, no middle-men, and keep direct relationships with the producers we buy from throughout the year. Furthermore, 100% origin products guarantee various hands are employed in-country, and the activity generates revenue and raises taxes locally, benefiting the country of origin. Then it is shipped to the end consumer, freshly roasted to order. Pretty much as fresh as it gets! Turn any cup of coffee into an anytime snack! Now, you can offer the delicious, authentic butterscotch flavor that turns any coffee into an easy indulgence any time of the day. * Open to Foodservice Operators in the 50 U.S. & DC, 18 years or older (or 19 for residents of AL and NE). While supplies lasts or 12/31/2019. Subject to Terms: www.CMFeelTheLove.com. Void where prohibited. Sponsor: NESTLE USA, Inc. Limit one (1) gift set per Operator/address. All trademarks and intellectual property are owned by Société des Produits Nestlé S.A., Vevey, Switzerland. Partnerships for de Jong Duke. “Thanks to Keurig-style products, OCS customers have become accustomed to paying 40-55 cents per cup for the coffee. Now, operators can deliver much higher quality at a comparable price, but yield greater operating margins.” Consumer Interface Nearly all B2C systems are used in a self-serve environment. Accordingly, the user interface is critical in explaining the dozens of beverage options available, the types of coffee offered and how to operate the system. “If a system does not offer touchscreen technology, it isn’t even in the game,” according to Snowden. Plus, this technology offers unique marketing opportunities and customized experience for customers. B2C isn’t right for all environments… On-demand coffee brewers are probably not economically justified in venues that serve just a few cups per day due to the high initial costs and the on-going maintenance tasks. Additionally, there is still a place for batch brewing – when a large volume of coffee is required in a short amount of time, such as banquets and catering. Another potential drawback is a more limited range of beverage offerings, particularly with only one B2C unit. In corporate breakroom environments, people often become accustomed to the rack of capsules or pods from multiple roasters. A success story B2C Brewing is not just for office breakrooms. A leading convenience retailer, RaceTrac, has 4 - 5 commercial B2C brewers in each of their 500 stores. “RaceTrac’s freshly ground, freshly brewed coffee allows guests to be their own barista by selecting their favorite blend that grinds before their eyes into a delicious cup of coffee,” states Tiffany Simmons, Category Manager for the chain. “We believe our coffee offering hits three major product requirements: high-quality cup of coffee, reduced labor effort, and reduced cost of goods.” And that is precisely why this technology has caught fire in the marketplace. f you are about to enter the world of roasting, there is a deluge of information being dumped on you which you have to decipher to make a buying decision on a roasting machine. a single shift per week. A better size roaster for Bill and Mary would be one that could do their immediate need roasting in one day leaving four days of growth: 125pounds / 18 roasts = 6.94 pounds per batch. This is about a 3-kilo roaster. IMPORTANT NOTE: Most manufacturers rate their machines in GREEN capacity which will be 16-20% MORE than what you will get out roasted. Ask each manufacturer if you can really roast the green volume they claim. It will be important in doing your math for sizing. What kind of roasting are you going to do – bulk blend roasting or single varietal profiling? Do you like to use cruise control and enjoy the ride or do you like to drift corners and hug the wall? It all comes down to how much control you want to have over the moving parts of the roaster and how much you are willing to learn to drive the machine. It can be argued that you will need less finesse in roasting blends – same thing every time, multiple times per day – than in single origins where complex changes in conductive and convective heat draw out maximum cup attributes. Many will want a roaster to do both. Take into account your business plan and figure out what percentage of your coffee will be blends like an espresso blend or house blend and how much will be single varietals used for hand drip or single origin espresso. Except for very committed single origin roasters, most find that blends make up close to 80% of roasting. Make sure you are not buying a high-performance 12 cylinder sports car when you need a reliable sedan. Perhaps you want to be able to do both as well. What does ‘Control’ mean to you? Coffee people like to control everything about everything in some roastersavant way. The truth is, very few can tell you WHY they want the control and what they can do with it. If you were given a drift break in a BMW M3 E36 you COULD control a drift, but would you know how? Most use of the word ‘control’ falls into two categories. The first is control over the variables in the roasting machine. These variables include fuel, airspeed, air volume, air temperature, drum speed, drum pressure, bean temp, rate of rise, drum skin temperature, and application of conductive and convective heat on purpose. There is virtually no machine that allows you to control ALL of these. The other use of the word control is describing the consistency of repeating the same roast over and over. This requires a stable roasting environment and usually an automation control that can handle fuel adjustments to keep you perfectly on track. Now go shopping! Once you know your volume, type of roasting and amount of control you want you are ready to start your research. You will be prepared to refine your answers based on what you learn about the different features of the equipment. Talk to manufacturer representatives first and look at blog postings last. Social media is full of strong opinions and little information. Buy the car/roaster that is right for you. Old Roastery Permits. New Environmental Rules by Scott Stouffer, Vice President, Probat Inc.
n my job I visit many coffee roasting plants ranging from small to large and new to old. At many older and smaller roasting facilities, I find roasters operating with no pollution control equipment or with pollution control equipment that is not functioning properly. When I inquire about the functional state of this equipment, I frequently receive an answer like, “My roaster is grandfathered.” My reply to this is short: “You are living a lie! Your roastery is one complaint away from a ‘Consent Order’ or a ‘Notice of Violation’. It is not a matter of if, but when.” In this article I’ll attempt to answer the following: •	What laws apply to roasting plant environmental permits? •	Why do emission laws vary from one location to another (Los Angeles compared to New Orleans)? •	Why do roasting plant owners / operators believe their facilities are grandfathered? •	How do you know if you need a permit or if your permit should be updated? Let’s start with a review of the regulations that shape present US roasting plant environmental permits: In 1970, the U.S. Congress passed The Clean Air Act, (CAA, https://www.epa.gov/clean-air-act-overview/clean-air-actrequirements-and-history). This legislation, created to promote clean up of air over the cities in the U.S., established the basis for our how air emission permits are issued and governed. The CAA limits specific emissions that cause smog, acid rain and other damaging pollution that may be emitted. Under the law, US States must regulate pollution within their borders. The law further requires States to regulate air pollution that moves from their State to another region. Finally, the CAA requires stationary sources to use Best Available Control Technology (BACT) to control emissions. In 1990, Congress passed significant amendments to the Clean Air Act (https://www.epa.gov/clean-air-act-overview). These amendments required the U.S. EPA to define and adopt a National Ambient Air Quality Standard (NAAQS, https://www.epa.gov/criteria-air-pollutants/naaqs-table) for the protection of human health and public welfare. The NAAQS sets air quality limits for specific pollutants CO, PM, NO2 and others, for durations of time (i.e. 8-hours, 3-months or 1 year). These limits are the basis for regional air quality standards, which occasionally make the news. For example, during an inversion in Denver, CO, the smog or particulate may increase above the NAAQS for an 8-hour period and the air quality could be deemed unhealthy. The CAA in combination with the NAAQS amendments forces local Air Quality Management Districts, AQMDs, to enforce air regulation specific to their areas. If emissions in an AQMD are above the threshold limits set by the NAAQS, the area is in non-attainment. AQMDs in non-attainment are obligated to enact rules to reduce offending air pollutants. A well-known example of local regulation in a non-attainment region is the continuously increasing emission regulation in California and its various AQMDs. California has globally fought smog through Nation leading automobile emission regulation. The South Coast AQMD (Los Angeles Region) has further regulated smog producing emission sources through the enactment of Rule 1153, (https://arb.ca.gov/drdb/sc/curhtml/r1153-1.pdf), which obligates stationary sources to use low NOx and ultra-low NOx burners. In 1995, the U.S. EPA published their first edition of section 9.13.2 of AP 42. In advance of this publication, the EPA conducted numerous source tests at Maxwell House, Hills Bros, Melitta and other coffee roasting facilities. The EPA measured emissions; CO (carbon monoxide), VOC (volatile organic compounds as Methane), and PM (filterable particulate matter) at the emission point of coffee roasters. In AP42, 9.13.2, the EPA published emission factors for these compounds as a function of the type of roaster and the pollution control device used. For examples, for a batch roaster with a thermal oxidizer, an average emission of 0.85 lbs of PM was found per ton of green coffee roasted. This document is noted as the first, definitive statement of BACT for coffee roasters. US EPA AP42 emission factors are noted today in many current roasting plant environmental permits! Old Roastery Permits If all AQMDs are required to regulate emission sources through BACT, how can any roasting plant be “grandfathered”? No roasting plant is grandfathered. If your roasting plant permit was issued prior to 1990, then it was issued prior to the NAAQS Amendments and the AP42 definition of BACT. Your permit was current then, but not now. Today, your roasting plant is permitting time-bomb. Your plant is one odor or opacity complaint away from an AQMD enforcement officer visit. Before arriving at your plant, the AQMD official will review your permit. She (or he) will see the permit is obsolete and will arrive at your plant with statements of current rules. You will be required to define a plan to bring your equipment to current standard. If you are required to sign a Consent Order, this will stipulate a time period after which your equipment must be repaired or otherwise made compliant. You may be obligated to complete a Source Test after you implement the corrections to prove your new or repaired equipment is compliant. What should you do if you know your plant is not compliant with your AQMD requirements? If your permit is current, and your plant is not compliant, fix it! Don’t wait for a complaint and the subsequent Notice of Violation. If your permit is not current, you should confirm the local AQMD requirements and develop a plan to make your roasting plant compliant. Schedule a meeting with your local AQMD permitting engineer to re-permit your roasting plant. If you arrive at the AQMD office with a plan, your new permit process will be a smooth process. If you are installing new emitting equipment, any installation with a stack, you are required to amend your facility environmental permit. This is a good opportunity to remediate any non-compliant equipment and update your permit. How do these regulations define your roasting plant emission permits? If your roasting plant is in an attainment zone, region with air quality measurements below the thresholds set by the NAAQS, your local AQMD will require your roaster to use BACT to control emissions as required by the CAA. This could include a thermal or catalytic oxidizer to control roaster emissions, a cyclone to control cooler emissions and dust collectors to limit particulate emissions from green coffee cleaning equipment. In most AQMDs within attainment opacity is limited to 20% for no more than 5 minutes per hour. (The following link references this regulation for the State of Tennessee with reference to several other SE States, https://www.epa.gov/ sites/production/files/2017-11/documents/chapt-05-2017.pdf.) This opacity limit will subsequently require all roasters to use an AP42 BACT device to control roaster emissions. If your roasting plant is in a non-attainment zone, like CA, Western WA, or most NE States, your AQMD is obligated to enforce rules such as SCAQMD Rule 1153, or PSCAA (Puget Sound Clean Air Agency) zero opacity regulations. These rules result in local definitions of BACT for coffee roasters. SCAQMD BACT definitions include ultra-low NOx burners for coffee roasters. PSCAA BACT statements require 1450F thermal afterburners or regenerative thermal oxidizers (RTOs) for roaster and cooler emission control. If you have 28+ year old, obsolete environmental permit and have installed new equipment within the past 28 years that is not listed on this old permit, you are in violation! The equipment installed over the past 28 years must comply with current rules. You must remediate and update your permit. Can a roaster be too small to require a permit? The U.S. EPA and most AQMDs exempt roasters with a batch size less than 10 lbs / batch from most air quality regulations. However, an operator of a small roaster may still be obligated to comply with local AQMD rules, such a low NOx burner or zero opacity. Please consult your local AQMD website to see if your small roaster is exempt. Need help? If you need help determining what to do about your permit or how to fix your pollution control equipment, please contact your roaster manufacturer or a local environmental consultant. We are here to help! Scott Stouffer, Vice President, Probat Inc.
nlike wine, beer and other alcoholic beverages, the use of fermentation in coffee remains largely unknown to many consumers of the drink. Even many coffee processors themselves are unaware of the potential for harnessing fermentation as a tool for improving coffee’s quality and consistency. In reality, almost all coffee goes through a fermentation process, with the main methods of production being wet and dry processing. Conventionally, spontaneous fermentation of the beans is facilitated by wild microbes, e.g., bacteria, yeast and filamentous fungi1. These microbes not only assist in the removal of the mucilage layers surrounding the coffee bean, they also produce some of the flavor precursors expressed during roasting and brewing. The effect of fermentation on the flavor and aroma of coffee has measurable impacts on the cupping score of coffee2 once roasted and brewed. For example, coffee beans processed via the wet method had a superior aroma profile highlighted by fruity and floral aromas, while coffee that underwent mechanical processing (without fermentation) contained many unpleasant chemical compounds3. One study looking at adding a yeast starter during dry processing found that some yeast produced higher sensory scores, and ultimately a higher-quality coffee with aromas of caramel, herbs and fruits; others did not4. This difference is due largely to the fact that different microbes consume and produce different chemical compounds that are converted into the volatile compounds that comprise coffee’s unique sensory characteristics. This parallels the production of wine, in which it is well known that the local microbiome is an important factor in terroir5. Taken to the next level, the visible parallels between coffee processing and wine production provide a potential competitive advantage to forwardthinking coffee producers seeking to improve their consistency, quality and flavor. For millennia, fermented beverages such as wine, beer and spirits were also produced through spontaneous fermentation. Sometimes this yielded fantastic results, but in many cases the product was undrinkable, depending on what microbes took control of the fermentation. Photo credit: Renaissance BioScience. Today, coffee processing operates mainly in this spontaneous fermentation “black box” of uncertainty. While coffee producers and scientists are fully aware of the impact of coffee fermentation, what actually goes on during the process and, more importantly, what microbes are good, bad or even important, are not fully understood. However, investing the time and effort into studying fermentation can certainly pay dividends. Since the 19th century, the wine, beer and spirits industry has been continually refining and developing its fermentation processes. Today, the use of techniques such as strain isolation and domestication, and selective breeding and adaptive evolution, have further optimized Saccharomyces yeast strains to the point that modern brewers and vintners now have at their disposal style-specific Saccharomyces strains that contain the positive attributes of several strains yet produce none of their faults. In addition, highthroughput non-GMO yeast development techniques are now being applied to quickly develop large numbers of novel beer yeast strains with improved flavor and aroma profiles, all while maintaining overall fermentation performance6. A focused effort in developing and utilizing coffee-specific Saccharomyces and other microbial strains should deliver similar quality improvements. First and foremost, using predetermined, pure and optimized microbial strains will allow the coffee farmer and producer much more control, consistency and specificity in their products. This also means they could modulate green coffee beans to suit changing consumer preferences or capitalize on current trends, without significant infrastructure changes such as planting new coffee cultivars or establishing new plantations. For larger organizations that source coffee beans from multiple farms and/ or co-ops, often from multiple locations around the world, standardization of the coffee fermentation process should produce more consistent green coffee, resulting in less variation in roasting and brewing (especially when factoring in different locations and roasters). In turn, more consistent green coffee ultimately reduces the need to store and blend coffee from multiple locations, while still meeting consumer brand expectations. Pulped coffee before the fermentation process begins. Photo credit: Renaissance BioScience. Optimizing coffee fermentation will also give farmers and producers the ability to express the full range of flavor and aromas possible from their plantations and coffee trees. For example, farmers can use selected yeast(s) to highlight a specific flavour and aroma profile, or accentuate a trait already valued in their product. Furthermore, sorted batches of the same coffee harvest can be fermented with different sets of microbes to highlight specific roasting and brewing methods, e.g., coffee farmers could process green coffee beans differently if destined for drip coffee rather than espresso. in and impact on coffee quality, have largely been left out of the discussion; this is because no one yet truly understands what makes for good coffee fermentation, or what microbial strains would be most beneficial in terms of yielding overall flavor and aroma improvements. However, this is all set to change: today, the modern tools and expertise needed to determine the relationship between coffee and microbes — and then leverage that information into the development of coffee-specific fermentation yeasts — are both feasible and available. Put all of this together and what you end up with are possibilities for coffee lovers that are limited only by the bounds of imagination. Coffee Holding Company..............SCA Booth #549 coffeeholding.com.............................. (800) 458-2233 From one bag to a full truck, Coffee Holding Company provides green coffee solutions to specialty roasters including exclusive Daterra Estate and Organic Certified coffees. Concordia Beverage Systems...... SCA Booth #1162 concordiacoffee.com..........................(800) 995-9019 Precision Engineering Meets Pure Coffee Obsession. Our reputation is built on outstanding products and on our ability to stay ahead of the competition with innovative features, customization, outstanding service, and ease of use. Brewista............................................ SCA Booth #885 mybrewista.com...................................(307) 222-6086 Bringing smart and honest innovation to the marketplace, Brewista designs, manufactures and distributes the finest brewed beverage products available. Bühler Inc........................................ SCA Booth #1241 buhlergroup.com.................................(763) 847-9900 Bühler covers the entire range of coffee production from green coffee handling, cleaning, to advanced color and foreign material sorters, to coffee roasters and grinders. C2 Imaging/ Identabrew.............. SCA Booth #1135 c2spark.com/beverage-dispenser-branding/............ ..................................................................(888) 872-7200 Since 1997 we have provided the beverage industry with IdentaBrew products. From design to installation, we brand your beverage dispensers and retail POP graphics. Cablevey Conveyors........................SCA Booth #301 cablevey.com........................................... (641) 673-8451 Cablevey Conveyors’ cable & disc technology gently move materials such as coffee through enclosed tubes without the use of air. Material degradation is essentially eliminated. Coffee Blenders...........................NAMA Booth #966 pourovercopacking.com.................... (760) 842-5522 NuZee, Inc. DBA Coffee Blenders is the only single serve pour-over private label coffee manufacturer that is SQF, Kosher, Organic, Fair Trade Certified. Eastsign Int’l Ltd..........................SCA Booth #352 & ....................................................... NAMA Booth #768 eastsign.com Eastsign is specialized in producing Instant Tea Powder with 2000MT annual capacity. Certificated by ISO22000, KOSHER, ORGANIC NOP. Main products: Tea Stick, Tea / Coffee Pod (Single Serve), Pyramid Tea Bag and Coffee Pod Filling and Sealing Machine etc. Fres-co System USA, Inc............... SCA Booth #909 fresco.com...............................................(215) 721-4600 Fres-co’s is synonymous with quality and reliability in flexible coffee packaging. Visit www.fresco.com, or call 215-721-4600 for more information on machinery and individual components. Nestle Professional Coffee-mate............................... ...................................................... NAMA Booth #1341 cmfeelthelove.com..............................(800) 637-8534 Coffee-mate®, America’s #1 creamer, is dedicated to foodservice and helping you build your business, with 7 creamer formats to meet your unique operational needs. Probat Inc......................................... SCA Booth #749 probatburns.com.................................. (847) 415-5293 Probat is the world’s most trusted name in providing comprehensive coffee roasting solutions. We deliver end-to-end solutions from design to manufacturing to installation to service. Wilbur Curtis Company Inc........SCA Booth #795 & .................................................... NAMA Booth #1454 wilburcurtis.com.................................... (800) 421-6150 For over 75 years, the Wilbur Curtis Company has provided state-of-the-art coffee and tea brewing equipment, including the worldrenowned G4 Gem-X® and ThermoPro-X® Brewing Systems. Mother Parkers Tea & Coffee Inc................................ ....................................................... NAMA Booth #435 realcup.com.......................................... (800) 387-9398 RealCupTM is a trademark of Mother Parkers Tea & Coffee, one of the largest coffee and tea manufacturers in North America. Xeltron SA....................................... SCA Booth #1178 xeltron.com............................................ (254) 935-8766 Xeltron’s latest XV CCD CAMERA sorter comes in 1,2 & 3 trays, sorting 2 to 18 tons/h. Small footprint, easy operation and excellent sort! Java Jacket..................................... SCA Booth #1215 javajacket.com.......................................(503) 281-6240 The Original Green Coffee Sleeve. Comes in 100% Recycled Natural Kraft or White. Can be custom printed with your design. he approach of the vernal equinox coincides with the beginning of trade show season. For many, it began with the National Coffee Association’s Crossroads convention in Atlanta March 7-9 in Atlanta. As I listened in on keynote sessions, participated in education sessions and visited with old friends and made new acquaintances, the value of attending trade shows such as this was apparent. My opinion regarding the value of trade show participation has not wavered as I migrated through various positions throughout my career, including assignments in Sales, Marketing, Operations, Purchasing and more in varying degrees of responsibility. In each career situation, I was faced with justifying the expense against the value. While I seldom attended more than four to five trade show events annually, I have made it a point to optimize my reason for attending. At the risk of being declared master of the obvious, I note many of the benefits of attending these events and attending with a plan. Networking – As a seller or a buyer, what better place is there to reach such a large number of prospects and clients than at a trade show convention. Booth visits, structured meetings, breakfast and dinner events as well as social hour meet and greets all provide the opportunity to have meaningful exchanges and lay the groundwork for opportunities. A well-orchestrated plan over a three-day show as an example should easily result in a dozen or more meaningful calls while still allowing ample time for structured events. This can represent some excellent relief to one’s travel budget, especially when you can connect with those more remote prospects. Moreover, most trade associations publish attendee lists in advance of their events, allowing for efficient pre-show contact and making meeting arrangements. Education – Most shows offer concurrent education sessions of noncompetitive content allowing for traveling teams to divide and conquer. As an operator, I fancied our company to be “in the know” and a progressive leader. Upon returning from these events, our team of attendees would reconvene and report our findings. Almost always there would be the discovery of multiple “nuggets” that we could evaluate and possibly implement. In the Coffee and Water Service industries, I have always been amazed by the willingness of operators to share success stories with competitors. Coffee breaks and receptions can be as fruitful as the formal sessions…and quite enjoyable. a signup box on your website and describe the benefits of membership. Cafe owners can keep a printed sign-up list on a clipboard in the cafe. Send your customers updates about your latest coffee roasts, specials and discounts, any other exciting news, and maybe even a birthday treat! #4 — Intuitive E-Commerce Selling your coffee on your website is becoming more important every day. If you have already set up an e-commerce site, try to purchase a few different products from the customer’s POV. Identify the frustrating sales. If the product page does not properly describe your coffee or you encounter other difficulties, imagine how your customer would feel. Making your site more user-friendly can be as easy as adding tasting notes, making the “checkout” button larger or adding higher-quality product photos. #5 — Photos (And Maybe Even Videos) Every business is unique; in fact, a book could be written about each. If a photo speaks a thousand words, you should be writing your own “book,” that is, creating a website that features vivid, descriptive imagery. Show interior and exterior photos as well as attractive shots of your product. If you have the resources to make a video, utilize it. In the early days of my coffee business, I created a basic website as more of a “referral-validation” resource. When I had the funds to move from validator to sales engine, I began by creating a video. After it launched on my homepage, the average time spent on the site rose from 19 seconds to 52 seconds. #6 — The Call to Action At the end of your homepage, you need a prompt that leads your visitors to where you want them to go next. For wholesale inquiries, provide a simple form to fill out. Cafes receive an option to get directions. End every page with a clear call to action that guides your visitors to the next logical step. The Payoff It’s easy to miss these six common mistakes. If you complete the items listed here, your website will generate more revenue for your business. Consider your website as the sales engine for your business. You have three ways to grow your revenue: Raise your prices; grow the number of customers; and increase the frequency of your customers. Create a website sales machine that can complete two of these, and, hopefully, enough demand to allow you to increase your prices. Cup for Educationâ&#x20AC;&#x2122;s mission is to help poor, rural coffee communities around the world build schools within their communities, and assist in providing them with teachers and the basic tools needed to educate the future generations of coffee farmers. Remember those back to school adventures shopping for your new loose-leaf or spiral notebook, the perfect pencil case, or the coolest book covers? In in these rural communities there are no pencils to put in those cases, nor books to cover. The children in these areas do not have the basics. With our help though, they can have the materials they need to study hard, create a better future, improve their coffees, their lives, and their countries. A little goes a long way in these countries. For $1,900 you can sponsor a teacher for an entire year in Nicaragua. You can put a roof on a school for $500. Imagine how many pencils $25 can buy. Books cost money, and many of the schools do not supply them to the students. These are just some of the ways your donations can help. Please join in our cause of improving the educational situation of our partners in this wonderful industry of coffee. As we send our kids off to school with their backpacks weighted down with books after downing our morning java, letâ&#x20AC;&#x2122;s give a thought to who picked the beans, processed them, and helped create that wonderful brew. Cup for Education is a non-profit organization with 503(C) tax-exempt status. 100% of all donations go to our projects. Donations can be sent to: Traveling Library in Chacaya 2013. The Traveling Library was created to bring story hours and book kits to rural schools in Santiago Atitlan. Billion cups that would equate to sitting in our landfills. This is the bigfoot of carbon footprints in the coffee category. “The ongoing challenge in the future for single serve is to address the environmental issues associated with the high volume of capsules being used and placed in the landfills. As coffee industry members, we must find the best balance among these main things – shelf life, functionality, cost, and green (recycling, composting, biodegrading). Maybe we should consider thinking outside of the box and look for ways to eliminate the capsule?” – Tom Martin - CEO Pod PACK International, LLC. Thankfully, like the evolution of functional coffees and revolution of coffee infused with cannabis byproducts, there are companies ahead of their time by raising the bar and pushing the envelope in the industry on the packaging side as well. This will ultimately have an industry-wide positive impact as the changes trickle-down to the consumer. NuZee, a California based single-serve pour over manufacturer, is one example offering an innovative alternative to the single-serve capsule seeking to solve the pollution issues associated with single capsules while elevating the experience to the consumer by providing an arguably much better cup of coffee. “I wanted to share with the U.S. market a simple and effective solution to the challenges the singleserve industry is currently facing by bringing to market in America a delivery format which is better to the environment while producing a high-quality drip brewed coffee with the same convenience of a single-serve capsule so I established NuZee to revolutionize the way single serve coffee is enjoyed in America” – Masa Higashida CEO – NuZee, Inc. The single-serve pour over also known as a drip cup is a delivery method that surprisingly enjoys an annual volume of over 3 Billion cups sold annually mostly in Japan and other Asian countries but is also experiencing rapid growth in the United States. It is up to us collectively as an industry to help guide and educate the consumer into a more environmentally conscious option, and right now the single-serve coffee industry is primarily focused on two main points, the focus on finding a solution to waste in the single capsule market and scalable alternatives to the capsule like the single-serve pour over coffee. 3% of American adults drink coffee daily, according to new market research announced at the NCA Annual Convention in Atlanta. The NCA NCDT report has tracked the consumer behaviors and perceptions shaping coffee trends in the US for almost 70 years. Overwhelming scientific evidence shows that coffee offers potential health benefits, from liver health to longevity. Yet many coffee drinkers remain misinformed about coffee and health, skewed by confusion and caffeine concerns. From sustainability to wellness, these realigned priorities mean that consumers are paying more attention to what’s in their cup than ever before. And while we’re not seeing a significant change in the quantity of coffee that people are consuming, there is a clear change in the quality and consideration of each cup. Most tellingly, in 2019 the share of gourmet coffee consumed past- day reached a new high of 61%. The data showed similar dynamics across espresso-based beverages, traditional coffee – gourmet, and gourmet coffee beverages on a past-week basis. THE NEW NCDT The NCDT report is more than a set of static statistics. It’s an industry tool for delving into the behaviors and perceptions driving the coffee industry in a historical context. In 2014, the NCA released an interactive dashboard to allow customizable reports. To that end, the 2019 NCDT has been redesigned as a PowerPoint file, to make the data, charts, and statistics more accessible for professionals to use. This shift is also seen in emerging consumer behavior patterns. Driven by younger coffee drinkers, we’re seeing a gradual but steady increase in the share of coffee prepared out-of-home and consumed after breakfast. The under-40 demographic is a formidable force in the coffee market. They’re driving remarkable growth in cold brew and ready-to-drink are also demonstrating exciting growth trends. Considering how recently they’ve reached mainstream markets, awareness of these beverages is high – 80% and 89% respectively. Both of these categories offer opportunities for innovation, from preparation methods to functional ingredients. PURCHASE THE 2019 NCDT The NCDT is a strategic investment for your entire organization. When you purchase the 2019 NCDT, you will receive the full report, plus one year of access to the NCDT online interactive platform, which includes the ability to customize on-demand reports by key demographics (see the video above to learn more). This year, we’re making the report itself available in as both a PDF and Powerpoint file to improve usability – whether for a customer meeting or internal brainstorming. If you have additional questions, please contact us at info@ncausa.org or 212.766.4007. 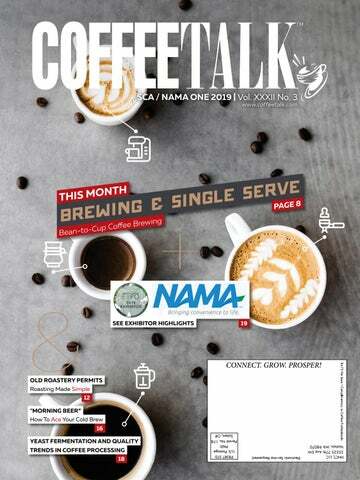 INDUSTRY OPPORTUNITY The latest NCDT also offers insight into potential opportunities for the coffee industry to connect with consumers. which is not built overnight, but as a core value that is aligned with measurable commitments and actions”, said Andrea Illy, chairman of illycaffè S.p.A. and author of A Coffee Dream and Espresso Coffee: The Science of Quality. “The role of the private sector is key to creating a sustainable society, of which companies represent the building blocks. If we want a better society for the next generations, we need to start from better companies. We are proud to be recognized by The Ethisphere Institute and thank them for their continued role in recognizing ethics leadership.” For more information contact illy@360pr.plus New, Super-Stylish Curtis ThermoProX™ Brewer Makes a Great “Fresh Impression” The ThermoProX Brewing System is the latest in the line of innovative, style-forward products from one of the world’s leading manufacturers of coffee brewing equipment, the Wilbur Curtis Company. Engineered with all the advanced features of the renowned Curtis ThermoPro® brewing system, the new ThermoProX offers a new, sophisticated design and styling that adds immensely to the counter appeal of any operation. It has modernistic rounded corners, an elegant sloping top, slender side panels, plus a textured honeycomb front panel that will truly turn heads. Stainlesssteel, vacuum-insulated servers keep coffee fresh, flavorful and at the perfect serving temperature without using external heat. With features like one-touch brewing, pre-set recipes and self-diagnostics, onboard Curtis G3 and G4 Technology make brewing Golden Cup coffee instantly simple, while keeping operators in control. What’s more, with Thermal FreshTrac® (TFT) technology, staff can monitor coffee freshness at a glance—from across the room. www. wilburcurtis.com. Chicago, Illinois –PLITEK® reduces environmental footprint and eliminates oil in one-way degassing valves! Plitek® announces their newest innovation, OilFree One-Way Degassing Valves! This product will help coffee roasters protect and preserve the quality of their roast, allowing them to offer the best coffee to their customers. am – 4:30 pm. Lead Instructor, Kathi Zollman of Coffee Holding Company is known throughout the coffee industry for her extensive contribution to the science of coffee roasting. Her work has been published in in various Coffee Trade Journals. As a trainer, Kathi brings decades of experience and enthusiasm for coffee. To register or for additional information please contact Coffee Holding Company (KZollman@ coffeeholding.com) , Organic Products Trading Company (MFerguson@optco.com) or Sonofresco (RPenrose@sonofresco. com). IdentaBrew® Flavor Tabs, Carafe Neckties, and Custom Clips are engineered specifically for your dispensing equipment, offering unique, cost effective opportunities to present your brand’s featured flavor or roast. the choice for nitro cold brew! Disclaimer CoffeeTalk does not assume the responsibility for validity of claims made for advertised products and services. We reserve the right to reject any advertising. Although we support copyrights and trademarks, we generally do not include copyright and trademark symbols in our news stories and columns. CoffeeTalk considers its sources reliable and verifies as much data as possible. However, reporting inaccuracies can occur, consequently readers using this information do so at their own risk. Postmaster: Send address changes to HNCT, LLC, 25525 77th Ave SW, Vashon, WA 98070 Subscription: The cost of a subscription in the U.S. is $47.50 per year; in Canada, the cost is $72.00. Free to qualified industry professionals. Non-qualified requests may be rejected. Publisher reserves the right to limit the number of free subscriptions. 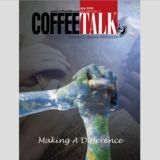 For subscription inquiries, please call 206.686.7378 x1 or subscribe online at www.CoffeeTalk.com. There has never been a better time to own a premium quality Probat artisanal roaster. Proudly built in the USA, our time-tested technology provides lasting value and competitive pricing. See for yourself at Booth #749.